The Chinese hell scrolls presented here treat the afterlife as a spectacle, as a display intended for public consumption. Ostensibly based on popular tales such as Tang Emperor Taizong's visit to hell in the first half of the seventh century C.E., they attract their viewers through their dark and yet cartoonish torture scenes, appealing to the same morbid curiosity fed by gothic novels, horror movies and Halloween ghosts in the West. Yet their main function was not entertainment but didactic, propagating a basic message of retribution. Every act of goodness will be rewarded; every act of evil will be justly answered. 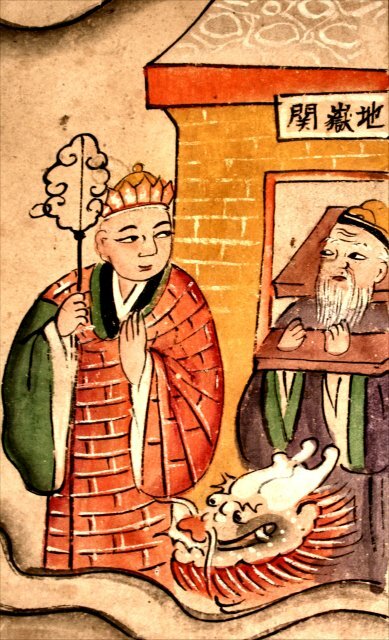 Releasing an animal intended for slaughter or financing the distribution of sutras will be recorded by scribes in heaven, improving one's chances of escaping hell for the "Pure Land" in the west. Cheating in the marketplace with deceptive weights and measures or behaving in an unfilial manner toward one's parents will be revealed in the karma mirror at judgment time, dooming the perpetrator to hideous torture. Retribution is certain, and the only unkown variable is just when it might occur. It could come in a year, a day or an hour, and that uncertainty in itself was incentive for immediate and constant moral vigilence. Bibliographies and other resources for further research. This website is part of an ongoing extensive educational project and database, and all images here (including the 100+ hells scrolls themselves) are the property of K.E. Brashier. To enter hell, continue to its Main Gates via the threshold depicted here to the right, and begin with the focal set of ten scrolls. On each scroll, there is a zoom function for closer inspection, and there are also a large number of "hot spots" that link to more detailed images, further information, other websites and photographs of historic sites in China (shot in the autumn of 2007) that similarly depict hell's gruesome retributions. This site was moved on January 2017 and updated with 19 new scrolls. The alias www.hellscrolls.org will always point to this page. Please change your bookmarks if necessary. In March 2017, we rewrote the essays on the A series and added 8 new scrolls. In January 2019, the number of scrolls on this website reached 141, and an eight-minute introductory video was added. We also added a section that includes almost two hundred illustrations of hell from eight iterations of the Jade records (Yuli 玉歴), mostly from the 19th century. On hearing this, Bright Eyes asked, "What happens during retribution in the hells?" and even a hundred thousand years would not suffice to describe them all."